Hi, writers! I wanted to let you know that I will no longer be blogging at this site. I have moved my major resources for writers, including my annual income posts, etc., to my own website. 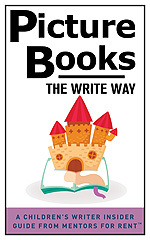 If you click on the For Writers button in the menu, you’ll find this page that gathers all the places I share info for children’s writers. I especially invite you to join the Writers for Children Facebook Group, where we talk about all sorts of things and offer each other support and information. (Just yesterday, I did a Live Video there sharing what kind of promo materials I’m bringing to an event for educators this weekend, for instance.) And if you haven’t signed up for my newsletter for kids’ writers, that’s another place I share info that I often don’t share anywhere else. Anyway, I just wanted to let you know that even my sporadic postings here are ending, but I hope you’ll still find plenty of information and inspiration in the stuff I share elsewhere! Thank you for reading and for your comments and thoughts over the past many years! Please note: Past postings here will remain here for the time being, though nothing new will be added. Hi, writers! This week’s audio update about my writing life is LIVE! If you’re interested, please hop on over and give it a listen.